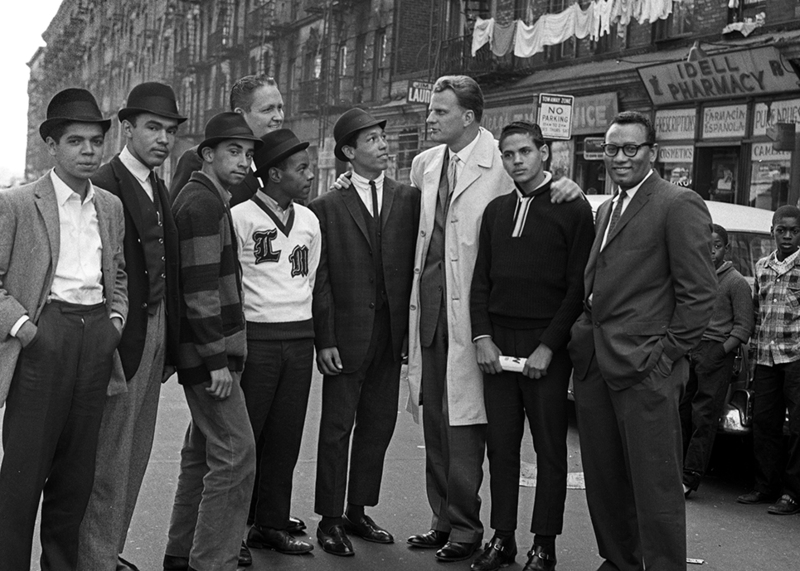 From the time he became a Christian, Billy Graham said, “I could not understand segregation in the church.” By 1952, he felt compelled to take what was considered at the time a dramatic stand. 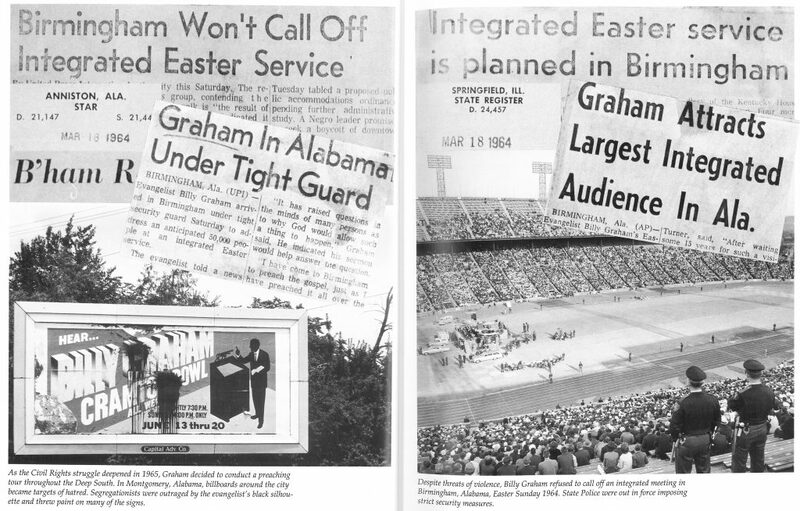 He was scheduled to hold a Crusade in Jackson, Mississippi, and the seating had been arranged to accommodate a segregated audience. Ropes were erected to keep blacks and whites apart. When Graham arrived at the meeting, he personally went over and pulled the ropes down and refused to let them be put back up. He actually physically took ropes down and symbolically, in doing so, said, “Look, we’re all equal before God, we’re all one together and every man has his right for the rights that we enjoy and want.” He took a lead in the stand way back in those early days when it wasn’t popular. Bill has always had a love for people and has appreciated and understood in a very unique dimension the worth of an individual no matter what his or her race, color, ethnic background many be. Some said Billy Graham made a lot of enemies in pulling down those ropes, but for him it was a matter of Christian conviction and conscience. Racial and ethnic hostility is the foremost social problem facing our world today. From the systematic horror of “ethnic cleansing” in Bosnia to the random violence ravaging our inner cities, our world seems caught up in a tidal wave of racial and ethnic tension. This hostility threatens the very foundations of modern society. Racism is a sin precisely because it keeps us from obeying God’s command to love our neighbor, and because it has its roots in pride and arrogance. Christians who harbor racism in their attitudes or actions are not following their Lord at this point, for Christ came to bring reconciliation—reconciliation between us and God, and reconciliation between each other. He came to accept us as we are, whoever we are, “from every tribe and language and people and nation” (Rev. 5:9). Tragically, too often in the past evangelical Christians have turned a blind eye to racism or have been willing to stand aside while others take the lead in racial reconciliation, saying it was not our responsibility. (I admit I share in that blame.) As a result, many efforts toward reconciliation in America have lacked a Christian foundation and may not outlive the immediate circumstances that brought them into existence. Our consciences should be stirred to repentance by how far we have fallen short of what God asks us to be as his agents of reconciliation. The issues that face us are complex and enormous, and simply wishing they would go away will not solve them. I do not pretend to know the full answer. But let those of us who claim the name of Christ report of our past failures and relying on the Holy Spirit, demonstrate to a weary and frightened world that Christ indeed “has destroyed the barrier, the dividing wall of hostility … through the cross, by which he put to death their hostility” (Eph. 2:14-15). Even though Billy Graham is deceased, this message is a God-send for such a time as this. Being a woman of God, but seeing the injustice of racism can possibly put me in a compromising position. Meaning, not focusing on loving ALL men, but focusing on just making things right on my own terms and not God’s. I have a charge, as the light of the world, to make a positive difference. Admirable sermons. It’s good to emulate him. He points people to Christ.